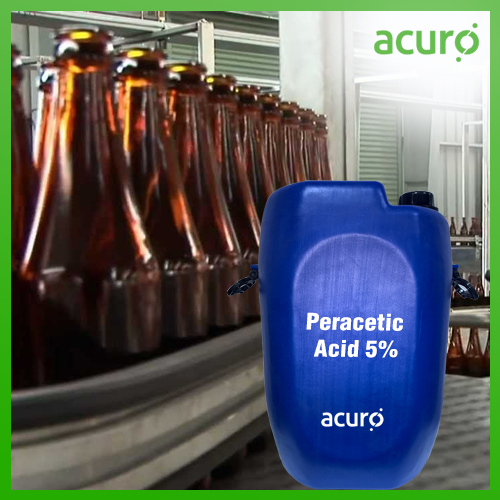 Peracetic Acid is an oxidizing agent broadly used as a disinfectant against microbes like bacteria, fungi, and viruses in food, breweries, wineries and medical industry, as a bleaching agent & slimicide in the paper and textile industries, as a polymerization catalyst or co-catalyst in polymer industries, epoxidation reagent for olefins and unsaturated compounds, etching circuit boards, in the synthesis of other chemicals & as cooling tower water disinfectant (it effectively prevents bio-film formation and controls Legionella bacteria). 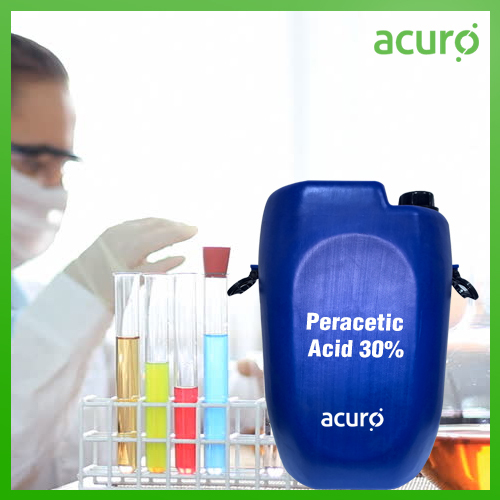 ACURO's Peracetic Acid is sold under the brand name ACUROX. 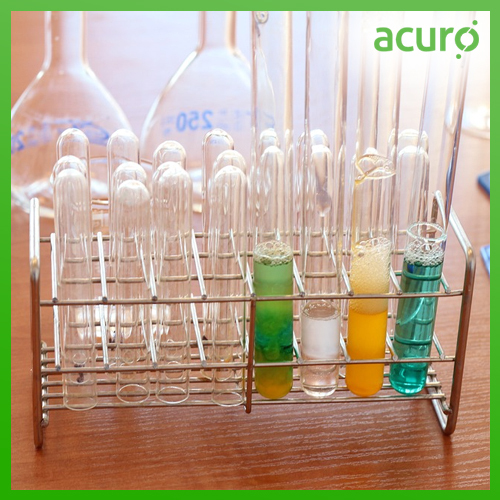 This class of oxidizing agent is available up to 40% concentration. It disintegrates into a non-toxic and water soluble by-products. It is frequently used for the synthesis of organic S-oxides in the pharmaceutical industry and in the manufacture of cephalosporins antibiotics from penicillins. Also, it is used to manufacture other chemicals and intermediates used in chemical industries. Non-corroding & non-foaming at normal dilutions. Wide temperature (34°F) and pH (up to 8.5) range. More effective than chlorine or quaternary amines in sanitization. Excellent disinfectant for cold plant operations. Easily disinfects at cold temperature. Degradable and eco-friendly (no chlorinated by-product). Rinsing after use not required. Peracetic Acid; Ethaneperoxoic acid; Peroxyacetic acid; Acetic peroxide. Wineries, breweries and beverage plants. Meat, egg and poultry processing and packaging equipment surfaces. Food (particularly sugar) and pharmaceutical processing and packaging plants. 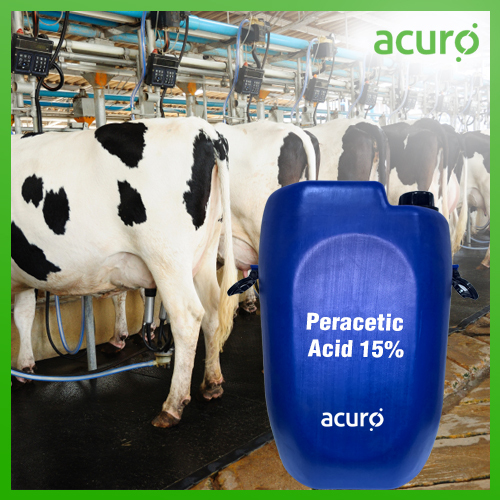 Disinfectant for equipments like pipelines, tanks, vats, filters, evaporators, pasteurizers etc. Disinfection of water, tools, equipment, boxes etc for aquatic plants & animals. Limiting the contamination in water bodies & inhibiting losses in plant/food production. RO/UF/NF membrane and ballast water (water carried in ship's ballast tanks to improve its stability) disinfectant. Disinfection of surfaces (tables, floors, walls, tools, appliances) in contact with food/feed. Cooling tower water disinfectant & polymerization catalyst. Disinfectant in Medical industries (especially hemodialysis apparatus & capillary dialyzer) and effluent treatment plant. Milk and dairy products processing and packaging plants. Seafood and produce processing and packaging plants. Liquid sanitizer for food and beverage industries. Clean equipment in wineries, breweries etc, Egg processing/packaging equipment surfaces, veterinary hygiene. Disinfection & biocidal application for equipments (pipelines, tanks, evaporators, plastic bottles etc), processing/packaging equipment surfaces in food industries. Sterilant for various equipments, mushroom farms, sugar manufacturing, soil, subsoil, warehouse/glass/polymeric foil equipment, concrete surfaces/mats/garden equipment, green deposits (gardening/floriculture/horticulture), cip/sip (clean/sterile in place) system in food and egg processing/packaging. Dairy disinfection (equipment/water disinfection, thermal fogging) and medicinal disinfection (medical equipment, cold sterilization of dentures, plastic implants, syringes, thermally sensitive nutritive media, disinfection of hemodialysis systems and decontamination of liquid and solid medical wastes in hospitals), antimicrobial disinfection in breweries and wineries, equipment disinfection (tanks, vats, evaporators etc), paper/textile bleach, RO/NF/UF membrane disinfection, processing/packaging equipment surfaces in food industries (particularly sugar industries). Terminal disinfection, Cooling water treatment, membrane disinfection. Textile bleach, membrane disinfection, pharmaceuticals and cosmetic industries. Make sure that there is adequate ventilation for concentrated chemicals. Always use appropriate chemical resistant gloves to protect your hands and skin and wear eye protection such as chemical goggles. Strictly avoid ingestion and inhalation. Do not expose at high temperature. Store the product in original containers in cool and dry place, away from sources of heat, flame and direct sunlight. Very toxic to aquatic life with long-lasting effects. Please refer technical data sheet, label, and MSDS for more details and shelf life. Eye contact: Flush with water for at least 15 minutes. If irritation occurs and persists, obtain medical attention. Skin contact: Wash with plenty of soap and water. If irritation occurs and persists, obtain medical attention. Wash clothing before reuse. Inhalation: Get fresh air. If difficulty in breathing or discomfort occurs, call a physician. Ingestion: Drink one to two glasses of water. Do not induce vomiting. Do not give anything by mouth to an unconscious individual. Call a physician immediately.